Alumni and supporters of Fulbright New Zealand have gathered in the capital cities of the United States of America and New Zealand in recent months to celebrate 65 years of Fulbright educational and cultural exchange between the two countries. Further celebrations are scheduled around the anniversary date of 14 September, 65 years after Fulbright New Zealand was formed by the signing of a bilateral treaty. 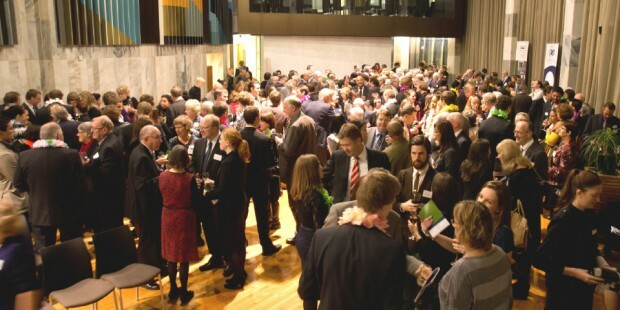 On 17 May, more than 120 alumni and supporters from across the US gathered at the New Zealand Embassy in Washington, DC for a 65th reception which was hosted by Rt Hon Mike Moore, New Zealand Ambassador to the United States, and attended by Fulbright New Zealand’s chairperson Helen Anderson and executive director Mele Wendt. Speakers included Adam Ereli, principal deputy assistant secretary for the US Department of State’s Bureau of Educational and Cultural Affairs, which oversees the Fulbright programme in America, Harriet Fulbright, widow of the programme’s founder Senator J. William Fulbright, and a panel of five US and New Zealand Fulbright alumni and grantees spanning the decades. Current Fulbright New Zealand graduate student Bryony Gibson-Cornish, who is completing a Master of Music degree at the Juilliard School in New York, gave a solo viola recital. Again, a panel of alumni from across the decades spoke, including 2008 Fulbright US Graduate Award recipient Siobhan O’Kane, who noted that “Fulbrighters are bound together by a special enthusiasm, passion and curiosity, and big bold ideas. A Fulbright award is not a one-off reward. It’s the seed of a lifetime of enrichment through story-telling, knowledge building and the support of a powerful network.” In the awards ceremony portion of the event, 53 of this year’s Fulbright grantees (from a record cohort of 83) and three Ian Axford (New Zealand) Fellows in Public Policy were honoured in person for their achievements. In September, gala dinners will be held at Villa Maria Estate in Auckland (on 7 September) and Government House in Wellington (on 14 September), which all alumni and friends of the Fulbright programme are warmly welcomed to attend. A working group of alumni are currently collecting artworks by Fulbright alumni and others to be auctioned at the gala dinners and online, with proceeds going to the endowment fund created this year to fund additional Fulbright exchange awards in perpetuity. Anyone with artworks to contribute, either by themselves or from their own collection, should contact the Fulbright office.